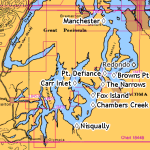 Marine Area Maps 11 and 13, ranging from the Northern end of Vashon Island to the farthest reaches of southern Puget Sound. This is the heart of South Puget Sound salmon fishing. This area has yielded many a wild ride for thumbs pressed to disappearing turns of monofilament following a surging salmon into the blue depths. If this area could only talk, the stories it would tell, big fish, hundreds of salmon derbies, countless hours of fishing enjoyed by thousands of anglers. This is the gateway to some of the best Chinook fishing and the longest salmon seasons in Washington State. Click on the area that interests you. 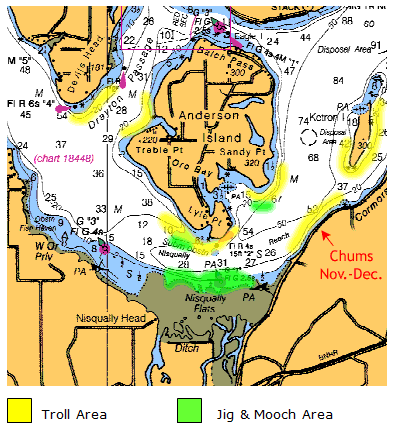 Forming the northern boundary of Tacoma’s Commencement Bay, Browns Point is squarely on the migration route for Chinook and Silver salmon bound for the nearby Puyallup River. Browns Point sees its fair share of winter blackmouth action, especially between the Browns Point lighthouse and Dash Point farther to the north. Trolling the area between the points can produce some nice resident kings. Best fishing would be on the 120-ft. line with your tackle trolled just off the bottom. During July you start to see the return of the kings to the Puyallup River with action peaking in August. Following the Kings, silvers bound for the Puyallup will start to show and depending on the amount of rain we get this area can be productive through all of September. I have had my best luck on Chinook during August fishing the deep drop offs located in front of Browns Point. Here baitfish are pushed into a pocket on the outgoing tide. 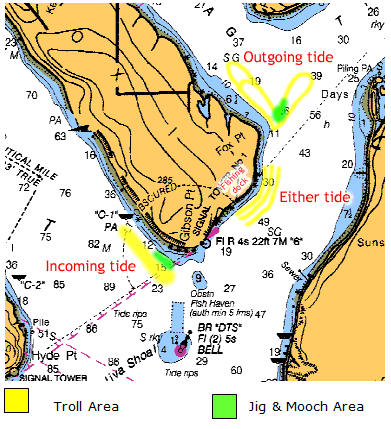 As the tide picks up flow, the bait from Commencement Bay gets sucked into a pocket here along the ledges, making it a target rich environment for salmon. Silver Horde glow white 5″ rattle plugs work well, as do flasher and squid combinations for fall kings and blackmouth. Let’s not leave out the whole and cutplug fresh herring, the trusted bait of choice for most local anglers. For fall silvers, trolling cutplug herring off downriggers or from a diving planer in the top 30 ft. of the water in the early hours can produce nice catches of fall Coho. Later in the day I have taken fish 50-90 ft. off the riggers trolling a figure S-pattern off the Point. Most of the Coho are hatchery fish and gearing down to lightweight rods and line can make the day’s fishing a lot more fun. One of my favorite techniques is to troll a flasher off the downrigger ball and run a Silver Horde Sonic Edge spoon or a cutplug herring just above it. Many times referred to as the “Ace in the Hole”, this setup gives you the attraction of a flasher without the pull on the line of the flasher when you hook up with a salmon. The closest public boat ramp to Browns Point is located just across the bay at Point Defiance Park. Carr Inlet reaches up into the fertile Oyster County of the Key Peninsula. 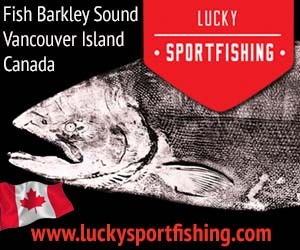 Not known as a top south sound salmon location but it can produce some limited opportunities when the season allows. The area between the West tip of Fox Island to Green Point will hold fish at times and is a good place to start fishing. Motor mooching just off the bottom accounts for most of the fish. If you don’t find bait here move on up into the Inlet. Trolling off Cutts and Raft Island can be productive and almost always you have the water to yourself. Moving farther up, Allen Point can be another sleeper spot along with trolling the middle of Henderson Bay near Purdy. In the fall Chinook and Coho return to Minter Creek hatchery and motor mooching out front can account for some decent fishing also. I would also try off Thompson Spit near Glen Cove. There is a ramp next to the Wauna Post Office in Purdy, it is very primitive and has a very small parking lot that requires you to pull out into Hwy 302 traffic to use. There is an unimproved ramp located next to the Fox Island Bridge. There is no dock and very limited parking. Narrows Marina 253-564-3474. They have a bait and tackle store and offer a full service marina with a gas dock and boat ramp. In 2012, in a volunteer effort, the second fish ladder was restored at Chambers Creek. The new ladder should assist runs of Coho and chum to get upstream which means increased runs of these species in the fall months. Salmon seasons can vary, so be sure to check WDFW regulations. Chambers Creek is located just north of Steilacoom. The Railroad Bridge crossing the creek mouth easily identifies it. Fishing takes place in front of the Railroad Bridge and to the north of it. Water depth at the creek mouth can run as little as 8-10 feet. As you move 50 yards off the creek mouth the water depth increases to 20-25 ft. This is the prime trolling area. The best producing setup is to run a 2-3-oz. cannon ball sinker on a dropper 8-10 in. long off the main line. Then attach a 6-7 ft leader with 2/3-3/0 razor sharp hook to a flasher. Bait up with a cut plug herring and you’re ready to troll. Let the setup down until the dropper makes steady contact with the bottom. The 10 in dropper will keep the thick cover of eelgrass from fouling your bait. Troll slowly; just keep the cutplug spinning. The nice thing about a Fish Flash flasher it has zero drag in the water, great for light tackle work. Troll parallel to the beach moving in and out until you hit concentrations of fish. Best fishing will be first light, not early morning first light, but the kind you find at 4:30 am. Dusk and then flood tide are the next best times. 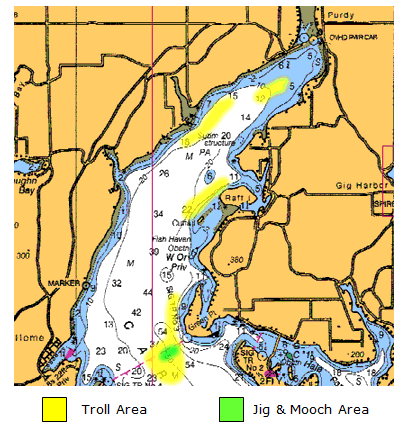 Jigging takes place 100 yards north of the creek mouth. There is a serious drop off here from 25-125 ft. The kings will concentrate on this drop off. The kings will stack at different depths along this drop off depending on the tide and the amount of sunlight each day. Pt Wilson Darts in the herring and candlefish patterns rule here. Try the 2-3oz. white and green & yellow color. Start jigging by setting up on the drop off, watch for concentrations of fish and stay on top of them. Most of the time lifting your rod 2-3 inches and allowing the jig to flutter down will produce strikes. Closest ramp is in Steilacoom. It’s just a driveway to the water and only for small boats (16’ or less). Open 24 hours. One of the top locations to target salmon is the southern end of Fox Island. Three of the top locations are Fox Point on Hale passage, the Concrete Dock on the South end and Point Gibson farther to the south can all produce fish. Fox Point is best to fish on an outgoing tide. Target the area just off the point. The bottom drops from 60-ft out to 150-ft. Blackmouth will hold on this deeper ledge. Trolling circles off the point shallow to deep can produce strikes. Watch for bait balls in the area the local fish will hone in on these. You can also troll the Northwestern shore in the 100-120 water up into Hale passage this spot can put out some fish. Point Gibson is better fished on the incoming tide. From Gibson Point troll the 90-ft of water up the shoreline to the big rock on the beach. The bottom is very irregular here and you will really have to keep an eye on your sonar. My best tactic has been to troll just above bottom, when I mark a bait ball on my sonar in one of the many dips along the troll, I kick the boat out of gear until my downrigger balls bounce bottom. I then put it back in gear. This tactic can really excite a blackmouth to bite. You can also pick up fish trolling out into the deeper 120-140 water off the point when the bait moves out. The public fishing pier (locally referred to as the concrete dock) on the south end of the Island can be a good spot to try on the last half of the incoming tide. Bait will get swept in here and fish will follow after it. The summer returning kings will rest in holes just south of the pier. Troll the 90-ft to 150-ft water out front of the dock. 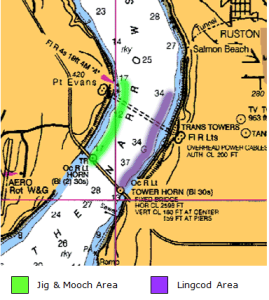 Best action on blackmouth will be one hour before to two hours after the tide change. Summer kings it’s a get the offering in the face deal, just troll with the tide. I will start with fresh herring on a 20 pound leader trolled behind the downrigger, if this doesn’t work, several spoons have over the years work well for me. Try an Apex Spoon by itself or a Silver Horde Kingfisher or if the bait is bigger a Sonic Edge fished behind an 11” flasher works real well. Top colors have been army truck, green & white and the police car for the spoons. Narrows Marina (253-564-3474) is only a mile away. They have a bait and tackle store and offer a full service marina with a gas dock and boat ramp. There is an unimproved ramp located next to the Fox Island Bridge. There is no dock and very limited parking. Over the past few years, Manchester pops up more and more frequently among top winter spots for Central Puget Sound salmon fishing. This Kitsap Peninsula workhorse sometimes takes a back seat to its well-known cousins Jeff Head just to the north, and Pt. Defiance to the south, but prudent anglers know Manchester provides consistent winter blackmouth action right up to the April 10th closer. Manchester inlet is one of the most reliable, wind sheltered and close by fisheries for winter blackmouth and is a quick boat ride from Elliott Bay, Tacoma or Bremerton. 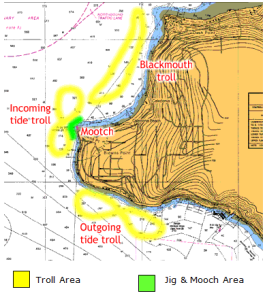 This area is good fishing for one simple reason, it holds lots of bait and all good anglers know if you find the bait you will find blackmouth. It’s a really short run from Elliott Bay and about 11 miles from Gig Harbor by water. One of the great things about fishing Manchester is you’re not restricted to one area, if the bite is off that day you have several other close by options. The majority of the fish will be taken between the fuel dock, and the turquoise boathouse located a mile just to the south. This troll or drift for moochers puts out the majority of the fish. The bottom is gently sloping in this area with a relatively smooth bottom, no big ledge or points. This makes mooching a good bet in the 90-100 ft water. Trollers will catch fish out in the deeper water here targeting suspended bait schools that attract the local blackmouth in to feed. Like most locations in this area the ebb tide seems to be the most favorable. You can catch fish on either tide, and normally the bite will happen 2 hours on either side of a tide change. The bottom is nice with few obstructions to hang up on so you can really get the downrigger balls right down there where Mr. Blackmouth lives. Seals can be a problem here, so be aware when lots of boats start to show up, so do the salmon belly eaters. In the Winter, blackmouth normally run from the just legal fish up to 10 pounds and of course there are always a few in the teens taken every year. Work the long trolling path from Orchard Point towards the Navy Fuel dock then in toward Manchester boat ramp and on down south about a mile. This area stays relatively flat with only a couple of humps. The majority of the bait holds in the 90-120 ft water here. When the bottom starts to come up turn east towards Blake Island and follow this ledge out until the bottom starts to drop off, then it’s a simple turn back North to complete the circle back to Orchard Point and do it again. Pay close attention to the fishfinder when you make the turn north, the bait tends to move up to the mid water depths here and the fish will follow, target just under the bait ball with the rigger, this is where the fish will be feeding. The best mooching happens between the Fuel Dock and the Manchester ramp. There is also great mooching on the North end of Blake Island the shallow bank here can really producer for moochers. The top mooching water is in 80-120 ft. Fish just off the bottom, with 10-12 pound leaders and a tight spinning cutplug herring. Use only the amount of lead you need to stay in contact with the bottom. There is a ramp at Manchester, it has a dock and it is only 5 minutes from the best fishing. The parking lot however, is small and won’t hold many rigs. For the Seattle crowd the Don Armeni boat ramp in Elliot Bay is a straight shot across the Sound from Manchester. There is also a small ramp in the city center of Port Orchard and at Evergreen City Park in Bremerton. Head south to Southworth and then run over to Allen Bank. At Southworth there’s a great hole just north of the ferry terminal. Troll the ledge here or move in close and pitch a herring in toward the beach and drift down the ledge. 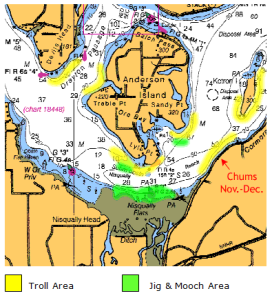 Is a great piece of salmon holding water that runs south off the southwest corner of Blake Island north of Vashon outward to perfect blackmouth holding water. This is a big drift, and almost always there are some fish around waiting to hammer tight spinning bait, even when the Manchester fishing turns off. The blackmouth can be caught here on either tide but the best action is on the ebb. Moochers will want to run 10-15 pound test main lines, with long 10-12 pound test, 4-5 foot leaders, with a selection of 2-6 oz mooching sinkers. Size your hooks to the bait. Insure the herring has a drill bit like spin in the water. Big ocean bright kings come rolling in at the beginning of August. They’re heading to the south sound mecca where Chinook still school in tide rips in numbers that make depth finders go crazy. Where the bite can happen so fast that the water looks like anglers are havinga butterfly-netting contest. Destination the Nisqually River. 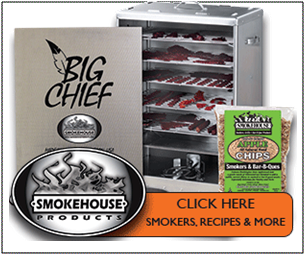 Home of one of the largest runs of south sound hatchery Chinook. You will start seeing these fish showing up around Pt. Defiance, Pt. Evans and on the south end of Fox Island near Fox Pt. and Gibson Pt. around the middle of July. Early August Lyle Point on the south end of Anderson Island is where you want to be. Over the years I have fished here that’s one of the most popular areas for kings. They take a bunch at Lyle Pt. and by Thompson Cove and fishing the eddies near Anderson Island. Near the tide changes you will definitely see rips forming off either side of the point near Lyle. This area holds plenty of bait and has been a consistent king producer. The first part of August, the action switches over to the green can off the mouth of the Nisqually River. Mooching and jigging are most popular here. The incoming and high tides are when the bite happens. Anglers have their best fishing at the tide changes, from one hour before to two hours after. Lyle Point at Anderson Island is where the action begins before moving to McCallister Creek-Nisqually Delta. Cut plug herring works well at Anderson Island mooched or trolled off downriggers. The green can near the Nisqually Delta Area produces better on Pt. Wilson Darts in white and green. Thompson Cove is a small cove just north of Lyle Point. Lots of bait in here, light line motor mooching herring works well, kings are taken every year in here in as little as 15-20 ft of water. Troll slow with the current and keep your bait near the bottom. Off Lyle Pt. the emphasis is on the southwest shoreline where it eddies on both sides. It’s a good mooching area. The bottom tapers off near shore from 30-100 ft. There’s a trough that holds baitfish. This is great holding & feeding water for kings. Moochers can get a good drift swinging parallel with the southwest shoreline. That will allow you to drift the deepest point. The water runs south to west. Constant adjustments are needed to stay near the bottom here. You will need 4-6 oz. of lead and a cut-plug. The closer to the flood tide the more emphases you should put on fishing the broken bottom on the shallow ledge. You will be able to see the edge of the ledge by the choppy water created by changing tide. When the kings move towards the delta fishing off the green can be a jigger’s paradise. 60-90 ft of prime water, when the tide run is slow will allow you to work your Dart right on top of the holding Chinook. Use the smallest size you can maintain bottom contact with. Use a stiffer rod like a steelhead back bouncer and one of the new super lines like Tuff-Line to a ball bearing swivel. From the swivel use a 4-5 ft. piece of clear 15-pound leader to the jig. Keep your line vertical in the water; you may have to back your kicker motor into the current to do it. Stay in contact with the bottom raising the rod tip and allowing the jig to flutter back down. One area that gets overlooked is the shoreline from the Nisqually River north. There was at one time a gunpowder loading pier on the beach, just north of the river. This shoreline all the way up to Ketron Island is good trolling water. A flasher rigged with a whole herring or a Silver Horde spoon in green and white glo can add to your score card. If the tide is out going troll north, on the incoming tide troll south along the shoreline. The bite is a distinct creature that tends to change day after day. Sometimes its dawn or dusk. Most of the time it will happen at the change of the tide. Fish as many of these prime times as you can to increase your odds. Starts mid July peaks mid August. Fish Lyle Point to start then the green can mid August. 3) Steilacoom is just a driveway to the water and only for small boats (16’ or less). Open 24 hours. Fresh herring, mooching tackle, flashers and salmon spoons. If you jig, Pt. Wilson Darts in 2-4 oz. size. 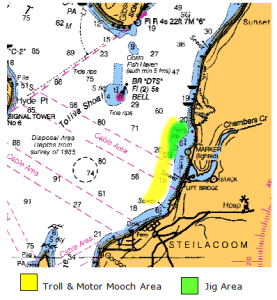 Tacoma – Point Defiance, the South Sound’s most famous salmon hole. If this area could only talk, the stories it would tell, big fish, hundreds of salmon derbies, countless hours of fishing enjoyed by thousands of anglers. Best of the entire gateway to the first of the returning summer king runs. The Clay Banks is the No.1 spot in the Pt. Defiance Area. The Point is the best fishing spot for one pretty simple reason. There’s a giant back eddy formed around the point on the outgoing tide when water flows out of the Narrows and around Pt. Defiance. The current forces the bait in to the Clay Banks rip and the salmon follow it there. The drift starts just off Owen Beach on the rip line and runs towards the lighthouse. The kings tend to hold just inside this rip line in the 100-160 ft. depth. If you’re going to mooch, set up your drift just off the picnic area near Owen Beach, get in line with the other boats and drift through the drift working your gear off the bottom. When you pick up, run outside the boats fishing, not through them, and start procedure over again. The other spots that hold summer returning kings in this area are in front of the Pt. Defiance Lighthouse, in the little pocket and drop-off in front of it. This is normally good on the beginning of the tide change and north of the Point out into the Narrows. The bottom out in the channel is a series of pockets and drop offs that will hold salmon. On the incoming tide move north and fish the sister hole to Pt. Defiance, Point Dalco on the south end of Vashon Island. The drift here starts in front of the ferry dock in about a 100-ft of water and you drift down to Pt. Dalco. The water increases in depth the closer you get to Point Dalco. Fish are caught along this drift. Trolling just like at the Clay Banks takes place outside the moochers’ drift. Trolling too close with downriggers will bring angry calls and one-fingered salutes from the mooching crowd. Best fishing happens at first light, dusk and one hour before to two hours after a tide change. The fresh cut plug herring is the number one bait in this neck of the woods. 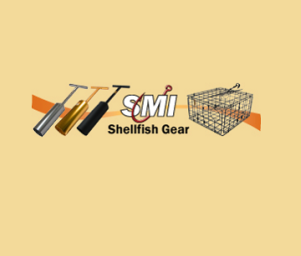 Begin your bait preparation with a sharp knife. Lay the herring on the cutting board with the head to the right, make one clean cut at a 45-degree angle behind the gills with the knife slightly angled toward the tail. Remove the head and viscera from the body cavity. Pre-tie several leaders with barbless 2/0-3/0 hooks in 12-14 lb. test mono, about 6-to 8ft. long. Take the first hook and run it through the abdomen and out through the lateral line on the side of the herring, leave it hanging free. Take the top hook, the 3/0, and run it out the top of the spine of the herring near the front of the cut. If you did it right it will spin like a drill bit in the water. Big kings like a tight spinning herring. Add a mooching sinker 2-6 oz. depending on the current and you’re good to go. Fish the total water column dropping to the bottom and reeling up slowly or watch your fishfinder and target feeding Chinook under the bait schools. Flashers in green glo with a cutplug herring or whole herring rigged in a helmet are super producers off a downrigger. Spoons like the Silver Horde Kingfisher have been recent arrivals and are gaining in popularity. The old tried and true produce, the salmon plug is still fished hard here. White and green have been good color choices. Unlike blackmouth you don’t necessarily find ocean returning kings always on the bottom, this is especially true in the morning hours. I have caught countless fish over the years trolling 40-60 ft down on the downrigger. These migratory fish heading back to the Puyallup River, Nisqually River and Chambers Creek will often travel in the mid water column. Look for the first of the Puyallup fish to show in the middle of July through the end of August. When the fishing starts to die near Pt. Defiance anglers will often move east and fish the Puyallup River mouth. Fish will stage here before heading up the river. This area opens on 1 August and over the years has proven to be an excellent fishery. 1) Narrows Marina 253-564-3474 is the closest. They have a bait and tackle store and offer a full service marina with a gas dock and boat ramp. Narrows Marina is a short run from just south of the Narrows Bridge. 2) Pt. Defiance Park 253-591-5325. A newly renovated eight-lane launch ramp, open year round sunrise to sunset is located next to the Vashon Ferry Terminal at Point Defiance Park. They also offer a bait and tackle shop, gas dock and boat rentals. Pt. Defiance ramp is the most popular and the closest. 3) There is a launch in Gig Harbor but it does not have a dock and parking is limited. Mooching tackle, sinkers, leaders, and fresh herring, flashers, and Kingfisher spoons. The closest and best salmon fishing off Redondo starts just about 100 yards away from the Salty’s Restaurant and the public fishing pier. Trolling from just off Saltwater State Park south to Dumas Bay is where most salmon seekers generally try. This productive area is best fished in the 90-100 ft. water before moving further off the beach as the sun gets brighter later in the day. Winter blackmouth are regularly caught on Pro-Troll flashers and Silver Horde spoons just off the bottom. Look for concentrations of baitfish; these will be the top producing areas for winter fish. Summer will see Chinook migrating past here on their way to south sound river systems. Top action on these fish will be fishing mid water, 40-60 ft. Trolling plugs and herring will be some of the top producers. 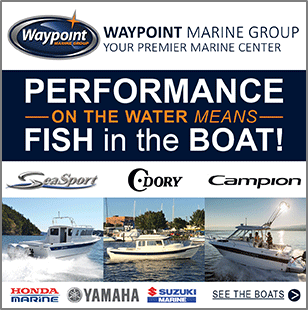 Running west across the sound from Redondo brings you to one of Puget Sounds top southern fisheries Robinson Point. The deep drop off here holds a ton of baitfish. Salmon will round this point on their way south. This area doesn’t receive near the angler pressure of Pt. Defiance but can be just as good of fishing spot especially for summer kings. Troll with the tide and bracket the area from shallow to deeper water until you find the depth the fish are migrating through. Then concentrate your gear in that depth range. A good sonar unit pays for it self here. Both moochers and trollers score fish here. Note: The Redondo boat ramp can be a tough launch and recovery on a windy day or a low tide, take both into account before using it. 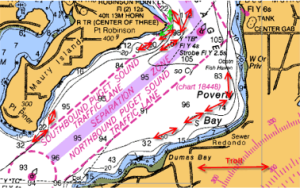 One of the top salmon locations in the South Sound is the Tacoma Narrows. Point Evans is the first Point just north of the Tacoma Narrows Bridge on the Gig Harbor side of the bridge. 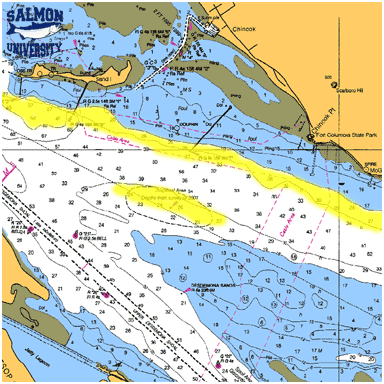 The currents through this area are strong and will push tons of baitfish into the area during tidal movements. The top fishing takes place between Pt. Evans and the bridge. On an incoming tide start your drift under the power lines near Pt. Evans and drift towards the Narrows Bridge. The second red ball on the power line from the shore is over 80-ft. of water and a good place to set up for a drift. If you’re mooching, drop your fresh cutplug herring down so it’s just off bottom. The strength of the current will dictate the amount of lead you will need to stay there. As you move south the Narrows will increase in depth and it’s important to keep your tackle just off the bottom to produce strikes. If you’re a jigger then bring a selection of Point Wilson Darts in herring and needlefish sizes or several different weights of Buzz Bombs. If the current picks up on you while jigging you may have to back into it with your kicker motor to slow your drift and keep the jig vertical in the water column to produce strikes. On the outgoing tide start just north of the bridge and drift back up to Point Evans. 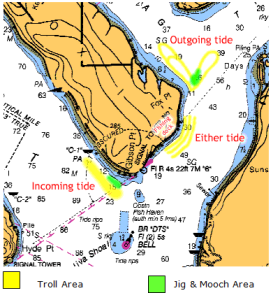 Since this area has such strong currents the best fishing will take place one hour before to an hour after the tide change on big tide changes. On days with lesser tidal movements you can fish two hours either side of the tide. Pt. Evans is a good year round producer for winter blackmouth and summer returning kings. 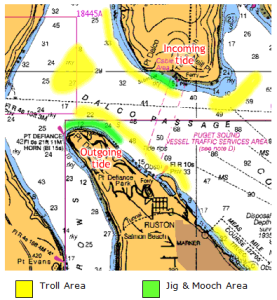 Check your WDFW regulations for season openings and closings, as the Narrows Bridge is the boundary between Marine Areas 11 & 13. The season and salmon limits can vary depending on what side of the bridge you are fishing on. During May, lingcod is targeted on the Tacoma side of the Narrows, drifting from Salmon Beach back to the bridge fishing large horse herring and sole. You need to hit a slack tide, but some nice fish are taken every year. Avoid fishing directly under the bridge as the wreckage from Galloping Gerty, the first Tacoma Narrows Bridge is laying there. This is a tackle grabbing nightmare for anglers. Another hazard in the area, besides the strong current, is shipping. Large ships, yachts and barge traffic pass through here so you need to keep an eye peeled at all times. Narrows Marina (253-564-3474) is the closest. They have a bait and tackle store and offer a full service marina with a gas dock and boat ramp. Pt. Defiance Park (253-591-5325) A newly renovated eight-lane launch ramp, open year round sunrise to sunset is located next to the Vashon Ferry Terminal at Point Defiance Park. They also offer a bait and tackle shop, gas dock and boat rentals.